On a couple of occasions last night the wind bashed Waiouru around waking both of us and causing me to think we might have acquired an unwanted temporary crew member! This morning I was again able to trick Jan into getting up first and turning on the central heating. Being on the “far side” of the bed does have at least one advantage. Jan had to make a decision about the scraps from yesterday’s blackberry jam and the wrinkled elderly apples in the fruit bowl. Bin or compost? In the end she came up with a more worthy idea and baked me a blackberry and apple loaf. Sorry swans….. you missed again! 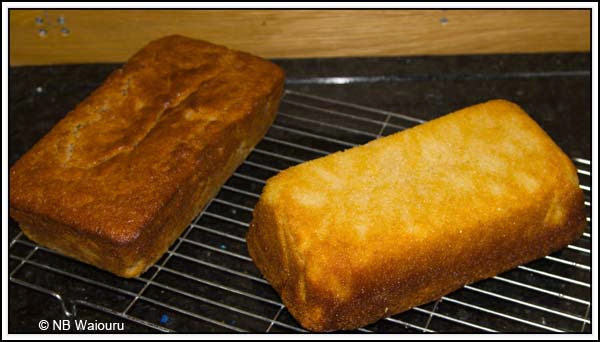 The left loaf is my moist blackberry & apple whilst the right is a lemon drizzle cake. <burp> Why have they been baked as a loaf? The boat is rectangular and room is at a premium. No round cakes on this boat! The third piece of good news was in an email to me from the UK Home Office. My visa application has been approved and it only took two months. I attribute this to one; or all; of the following reasons. The effort we went to in presenting the application and supporting data along with the use of the UK Settlement Service. It’s been an expensive exercise, but now I no longer have to dive into the cabin each time we see a CRT enforcement officer! Congratulations, now you will be able to cruse indefinitely and not have to worry about the Immigration police. Keep the blog going as we like to follow your travels and tribulations from here in NZ. I like to track your movements using Water Explorer and look at the canal you have just travelled. Every time you post a photo of the Tararua Ranges you make this Palmy boy homesick!